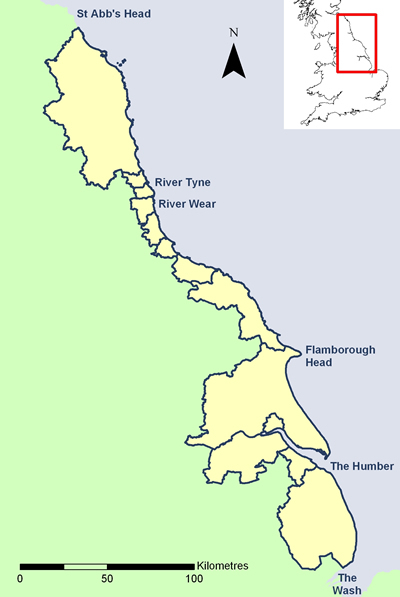 The North East Coastal Group (NECG) has jurisdiction over the length of coastline from St Abb’s Head in the north to Gibraltar Point to the south, a distance of approximately 350 km. As a technical group, principally comprising of coastal managers, planners and others with knowledge of shoreline management and operating in a strategic context, to be a source of expertise on the coast and to advise and influence the relevant Regional Flood Defence Committees (RFDC) on matters relating to the coast. To recommend to the EA who is best placed to take the lead for Shoreline Management Plans, Coastal Strategies etc and to work with others towards Integrated Coastal Zone Management (ICZM). To identify, develop and disseminate best practice with regard to project management, procurement, delivery and general management associated with sea flooding and coastal erosion risk. To encourage the development of a co-ordinated approach to the collection and storage of data relevant to the effective long term management of risks at the shoreline. Through discussion with the Department for Environment, Food and Rural Affairs (Defra), Chairmen of RFDCs and the EA, to ensure the views of member organisations are considered and taken into account in the development and implementation of national policies and initiatives relating to the effective management of flood and erosion risks at the coastline. To work closely with adjacent coastal groups and EA RFDCs in advising on any mutual matters of interest relating to managing sea flooding and erosion at the shoreline. To advise upon research and development needs within the NECG region in respect of coastal and shoreline management, monitoring and coastal engineering. To act as a principal forum for those charged with managing the coastline within maritime authorities, the EA and others within the NECG region. To share expertise and examples of best practice between NECG members and, when mutually acceptable and advantageous, to share resources. To develop and deliver a regional strategic coastal monitoring programme and to work with the EA towards a coordinated and integrated national strategic monitoring programme. To ensure that the conservation and enhancement of the natural environment is maintained as a core consideration across the full range of coastal defence and flood risk planning and delivery. Furthermore, that group members and key partners are made aware of their duties regarding designated nature conservation sites and Biodiversity Action Plan habitats and species.